The following is based on research done by Dario Bonazza and published in Spotmatic magazine, number 29 from July 2001. At Photokina 1972 Pentax and Carl Zeiss showed prototypes of a 15mm f/3.5 rectilinear lens with remarkably similar optical designs. In fact, the only noticeable difference was that Zeiss’ lens employed only spherical optics while Pentax’s made use of one hybrid aspherical element. In 1974 both prototypes became production lenses. 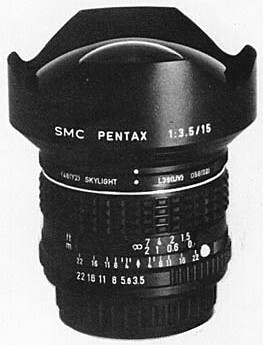 Pentax’s SMC TAKUMAR 1:3.5/15 was virtually identical to the prototype from 1972 whereas Zeiss’s lens used the same optics but employed floating elements, probably for improved close-performance. Here the story gets really interesting and a bit unclear. Pentax was of course proud of their aspherical optic, and did mention it in some early lens brochures. However, shortly afterwards they decided that the production of the aspherical element is too expensive, and started developing an alternative optical formula based solely on spherical surfaces. The aspherical element was no longer mentioned in any Pentax publication, but until the new optical design was ready, all 15/3.5 lenses were based on the original design. The first 15mm lenses based on the new design were produced in October 1975, about four months after the introduction of the K-mount. For a short period of time, screw-mount and K-mount lenses were produced in parallel, so Dario believes that a total of about 900 Takumar 15/3.5 lenses were produced, 400 of which employed aspherical construction. 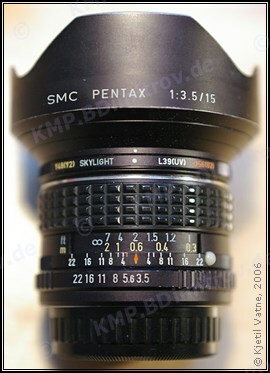 On the other hand, only about the 100 of the SMC PENTAX 1:3.5/15 were aspherical. The remaining SMC PENTAX 1:3.5/15, all SMC PENTAX 1:3.5 15mm and all SMC PENTAX-A 1:3.5 15mm are based on the spherical optical formula. In order to compensate for the lack of aspherical surfaces in the second optical design, Pentax changed several of the optical elements, including the size and curvature of the front element. The exact differences or measurements, however, are not known. In late 2005 I received a very interesting e-mail from Conrad Eckhardt, who had made the following observation: the image that I was displaying on this page at that time showed a lens whose distance-scale in feet is … 7 4 2 1.5 … and the “standard” SMC and SMC-A lenses have a distance-scale sequence of … 7 3 2 1.5 … Indeed!!! Although this is no proof, it fits very well with the research by Dario, so I consider it likely that when Pentax redesigned the optical construction of the lens, they also “recalculated” the distance-scale. In other words, it is my opinion that lenses with the name SMC PENTAX 1:3.5/15 and a distance-scale that includes a 4-foot-mark have one aspherical element. I have gathered some serial numbers. As you see, the boundaries are somewhat fuzzy. If you own one of these four lenses, please e-mail me the serial number. Finally, here are two pages in Japanese from Hidenori Nohara who owns versions 1 and 3 and has made some coparissons: page 1, page 2. I am not aware of any comparisons of the optical performance of the the aspherical and spherical variations of the 15/3.5 lens, but the latter is superb. And one would guess that the aspherical one is even slightly better, at least at close distances.